I just did my big free OT last week for my birthday. That’s Over Town, for you mainlanders. Catalina Express offers a free round trip ride to the island on your birthday. Once here you can get neat discounts and other free stuff. It’s a smart way to let people who ordinarily could not justify the cost of the ride (about $78/ rt) for a day trip. Once here they see how doable it is and are likely to return with friends. I went in reverse to Long Beach where I was reminded of why Catalina looked so yummy to me. The Long Beach dog park was pretty good for urban, but was flanked by what looked like about 100 homeless people and all their stuff. The noise, confusing one-way or cowpath diagonal streets, grime, all made me grateful to get back on the island again. The only thing I pined for was inexpensive (!) Kefir at the Trader Joes. This season is all about a sunless overcast state called June Gloom. I hear it lasts at least two weeks, if not three. The sky is white without fog and some days it doesn’t break up all day. The locals use this time to wind up for the frenzy that is July through Memorial Day. The visitors who are brave enough to visit without the benefit of bright sun and blue sky are rewarded by smaller crowds and the planned June Gloom events such as the Flying Fish Festival for which this amazing sand sculpture was prepared. This entry was posted on Sunday, June 9th, 2013 at 2:39 pm and is filed under Uncategorized. You can feed this entry. You can leave a response, or trackback from your own site. 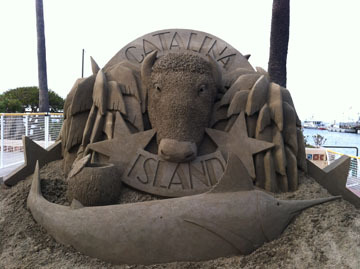 Glad to see that you are still enjoying Catalina. As a ‘Zonie sailing out of San Diego, the island has long been a favorite. Nice to enjoy it through the eyes of an inquisitive new visitor.